It's tough to get a movie made in Hollywood, and much has been said about Ryan Reynolds' journey that took the better part of a decade in order to get Deadpool made. A lot happened in the 10-year period in his career, perhaps most notably the failed Green Lantern movie that he starred in. Interestingly enough, as it turns out, even during the filming of that movie he was focused on Deadpool. So much so in fact that he and writers Rhett Reese and Paul Wernick worked on the script for Deadpool while Ryan Reynolds was filming Green Lantern. The actor recently guested on the THR Awards Chatter Podcast and Deadpool was a major topic of conversation. 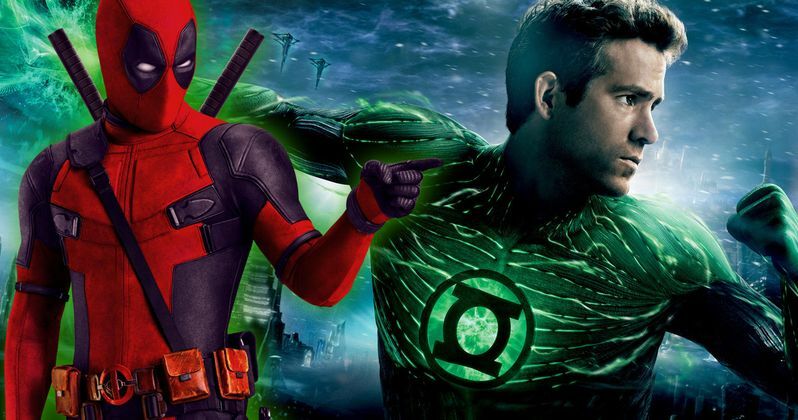 Ryan Reynolds revealed that while he was making Green Lantern, Fox found a renewed interest in getting Deadpool made, so he decided to work on the movie, which is a competing franchise at a rival studio. Here is what he had to say about it. "The weird plot twist was, somehow, some way, Deadpool got reinvigorated at Fox while [Green Lantern] was happening. ... What a lot of people don't know is [writers Rhett Reese and Paul Wernick] flew to New Orleans and, while I was shooting Green Lantern, we were actually all together writing Deadpool." Ryan Reynolds talked a lot about the long process of getting the movie made on the podcast and he was so committed to Deadpool that when he realized he may actually get the part in Green Lantern, he offered to drop out if Fox thought making Deadpool was a real possibility. They told him it wasn't, so he moved ahead with Green Lantern. As he points out, even though Fox told him it wasn't a possibility, Deadpool once again became a reality, so despite the fact that Warner Bros. probably wouldn't have loved it, he as well as Rhett Reese and Paul Wernick decided to get the script going. That turned out to be a good decision. Here is how he described the situation. "I quickly called the executive I knew at Fox who had Deadpool and I said, 'Look, I am standing at the altar right now, and I'm about to say "I do" to someone else. I will walk away from this if you even think that you can make a Deadpool movie with me.' And he said, 'Unfortunately, no, I don't think that that's gonna happen.' So I went off and did Green Lantern." The successes of Deadpool have been talked about a lot, but it is truly surprising just how big of a hit the movie wound up being. Working from a budget of just $58 million, Deadpool grossed $783 million worldwide. Outside of the financial success, the movie was really embraced by critics and most definitely the fans. Now, what is perhaps most surprising is that as awards season ramps up, it is seeming more and more likely that Deadpool will wind up getting an Oscar nomination or two. The movie scored a Golden Globe nomination for Best Picture (comedy or musical) and Ryan Reynolds scored a nomination in the Best Actor category. Deadpool was also nominated by the Writers Guild of America in the Best Adapted Screenplay category and the Producers Guild of America also gave the movie some recognition recently. All of this to say, Deadpool, an R-rated, ultra-violent superhero movie nobody wanted to make, could wind up a nominee at the Academy Awards this year. On the podcast, Ryan Reynolds promised a big surprise for fans if the movie does get an Oscar nomination. "We had no idea we would ever get anything beyond an MTV Movie Award best kiss nomination. If it does end up in that category, I think that's kind of a cool moment, for not just us, but for everybody, for the people that went to see the movie, the people that made the movie, the studio, even the Academy. I don't think that any superhero film has ever really broken that glass ceiling, so it would be nice to see one like Deadpool do it. And I can certainly promise one f*cking crazy reaction video online. In the Deadpool suit. Guaranteed." Even if Deadpool doesn't wind up with any Oscar nominations, it will go down as a massive success and something that will change the thinking in the industry moving forward. Whereas something like Green Lantern helped change the thinking at Warner Bros., but for less positive reasons, since the movie bombed in a big way. Thanks to the success, fans can look forward to Deadpool 2, which doesn't have a release date but is expected to film this year. The movie is once again being written by Rhett Reese and Paul Wernick, but director Tim Miller won't be back, since he left over "creative difference." Instead, it will be John Wick co-director David Leitch at the helm.